Just before 1pm scores of people identically dressed in white weapons inspector suits and brandishing scale models of Paveway bombs, the weapons EDO MBM manufacture in conjunction with Raytheon for NATO troops in Afghanistan, met at the Level in Brighton. Numbers soon swelled to close to a hundred despite heavy rain. They were met by several vanloads of police from Sussex, Kent and Hampshire, Evidence Gathering Teams (EGT) and Police Liaison Officers (PLOs). PLOs are a new police tactic which is being trialed by several forces as a way of dealing with potential threats from mass demonstrations. The tactic is based on a consultation with Dr Clifford Stott, owner of a company called Crowd and Conflict Management. PLOs were countered by teams of FITwatchers who used banners and placards to prevent PLOs entering the mass of the demonstration. The assembled weapons inspectors heard speeches from Smash EDO, FITwatch and from one of the Decommissioners, the affinity group who broke into EDO in 2009 and sabotaged the production line to prevent the supply of weapons components to the Israeli military for its ongoing massacre in Gaza. The march began, surrounded on three sides by banners, including a reinforced front banner, and accompanied by several sound systems. 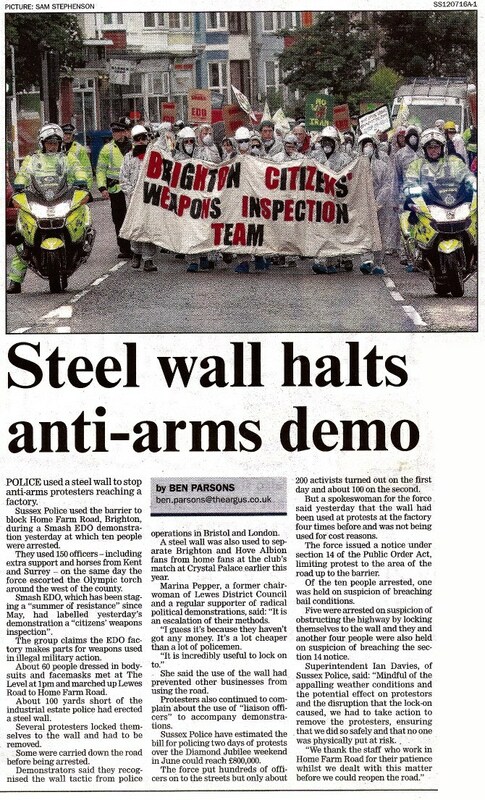 Passers-by on the Lewes Road were given information about the ongoing campaign against the Brighton arms factory. The police followed the march with vans and motorcycle cops but were hands-off until the marcers arrived at Home Farm Road. The demonstration turned into Home Farm Road, where the EDO factory is based and was faced by a line of police watching from the verge above them. About three quarters of the way up the road police had erected an eight foot tall metal and perspex crowd barrier, entirely blocking the road, flanked by Hares fencing cages. As demonstrators approached the barrier police could be seen through Perspex windows. The South section of Home Farm Road was occupied by scores of police vans, the majority from Kent, mounted police and CCTV vans. The barrier was designed to slide open to let traffic through. Undeterred, the weapons inspectors produced d-locks and lock-on tubes which they used to fix themselves to the police cordon, thus completely closing down the industrial estate and preventing movement in or out of EDO MBM. Other inspectors, intent on getting to the factory, climbed over a fence behind the police cordon and managed to hang a banner directly opposite the factory gates, despite hundreds of police attempting to enforce the Section 14. The unit of police occupying the verge above approached and, after a stand-off lasting nearly an hour, announced a Section 14 was in place. Protesters were unable to hear the Section 14 order at the time but were later told (during police interviews) that the cops intended to keep them behind the cordon until 4pm and then clear the road. Anyone who disobeyed was liable for arrest. Police eventually managed to move the protesters who had not locked-on further down Home Farm Road, making five arrests in the process. They then began to scratch their heads about how to remove the lock-on. The last of the locked-down protesters were not removed by a cutting team until 5.30pm. The four were arrested and taken to Hollingbury nick. The detainees were released at 1am. Sussex Police, keen to take any opportunity to limit the ability of the Smash EDO campaign to organize against the company, imposed stringent bail condition preventing protest at the factory and, despite the minor nature of the charges, conditions for defendants not to contact one another. Attempts were made to remand one detainee, but police were later forced to release her by a technicality, namely that the charges were made-up. The demonstration was a part of Smash EDO’s Summer of Resistance, three months of relentless action against the factories which has included mass demonstratration, critical masses, phone blockades, and an art not war demonstration to name but a few. There’s still ten days of the Summer of Resistance to go - why not come and do your own action. This weekend Smash EDO hosted a gathering to organize a mass mobilization against the G8 conference, to be held in the UK in 2013. Participants in the gathering came from all over the UK with contingents from Manchester, Bristol, Birmingham, London, Cardiff, Lewes and Edinburgh to name just a few. The gathering launched a new network aiming to meet in locations around the UK in the coming year to build resistance to the G8. A workshop is planned at Earth First in August and the next gathering will be held in Birmingham on 22nd September.